Most shoes are sold according to length measurements. 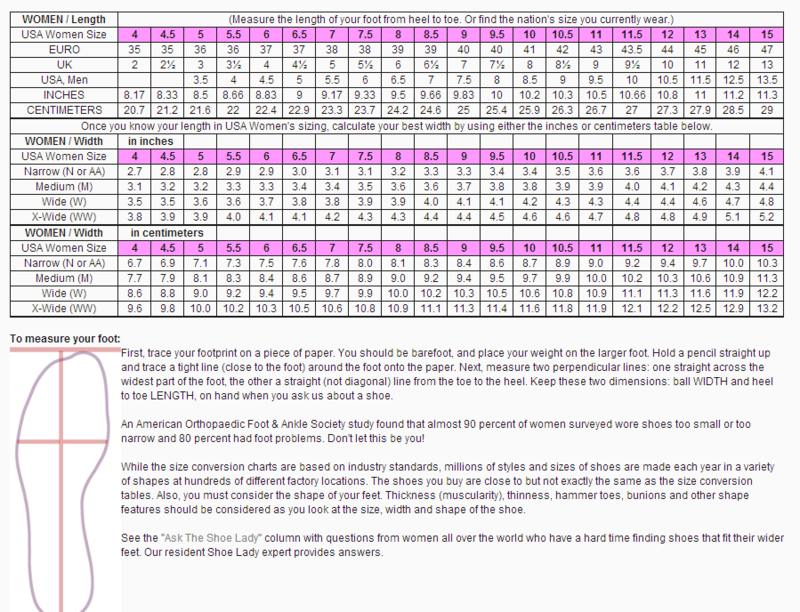 In the USA shoes are also sold according to width measurements. But shoe fit depends upon how the volume of your foot fits into the empty volume of the inside of a shoe. When you think about it this way….. filling an empty glass with water is like filling a shoe with your foot…. it is easier to understand the importance of considering the width and thickness of your foot when you buy shoes. Understanding shoe fit is more complicated for women than for men because the shapes and styles of our footwear have so much more variety. You may need one size and width for sneakers, and an entirely different size and width for pointy toed, high heel pumps. Sandals or flip flops enclose so little of your foot that they may be the easiest styles of all to buy. Whether you need extra wide women’s shoes or extra narrow women’s shoes, it’s a good idea to understand how shoes are made and sized in order to get a good fit. See the “Ask The Shoe Lady” column with questions from women all over the world who have a hard time finding shoes that fit their wider feet. Our resident Shoe Lady expert provides answers. Shoe manufacturers have standardized rules for how to measure length but shoe width measurements are much more variable. There is some general agreement that a shoe increases 3/16th of an inch around the circumference of the ball of the foot for every increase in width for the same length. But different manufacturers accomplish the extra width differently. Some may cut more material for the upper part of the shoe. Some may cut the sole slightly wider. Some may only increase the width for every full size length change – or even every couple of size length changes. You never can be sure as the manufacturing processes can differ even for the same style. SS = AAAA = “extra slim” or “quad”, the narrowest size generally available. Even these widths are increasingly rare. M = B = “medium”, the most common or “average” width for that size. WWW = EEEE = “triple wide’. These widths are even more rare than the SS widths, although that may change as the rate of obesity increases. Obesity is only one of many factors that make for wider feet. And one can be obese but not have wider feet. Even the width measurements above do not consider the thickness or girth of your foot. They only measure the one dimension – an outline of your foot from one side to the other on paper, across the widest part of your foot. So be prepared to buy shoes in several sizes depending on the style you want and whether the length, width or depth of your foot, or overall shape of your foot, is more suitable for the style you want. We had a customer not long ago who was wearing size 11M’s because that was the easiest size to find that she could get her foot into. But the shoes didn’t fit well, or look good, at all. After some experimenting she discovered that her best shoe size was an 8.5WW! She needed the width but was buying the length in order to get the volume she needed in a shoe! For more details on shoe fit adventures, read Ask The Shoe Lady. Long time shoe salesmen have theories about customers who need different widths. They used to favor customers with very narrow feet. The stereotype was the elegant, rich southern belle who loved to spend money on expensive shoes. Wide feet were considered “peasant” feet and were stereotyped with lower price shoes. In more recent years the stereotype has changed. Very narrow feet are seen to belong to very cranky customers who’s feet are always in pain because they lack cushioning and who try on dozens of shoes but never buy. Wider feet are seen as belonging to healthy, athletic young women who are interested in a variety of sport and comfort shoes and will soon be buying career and party shoes. Times change. Many years ago women could buy shoes in “combination” lasts – the ball of the foot would be slightly wider proportionately than the heel area. These are no longer available. They were primarily for narrow and slim feet and the shoe industry is no longer catering to this size group. Also – somewhere along the line shoe manufacturers realized that women’s feet are actually shaped differently than men’s feet. Our heels are proportionately more slim than those of men with the same length feet. Once they realized this and started making narrower heels in women’s shoe lasts, there was no more reason for making “combination lasts”.